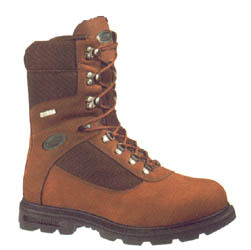 BOOT: WATERPROOF NUBUCK LEATHER/1000 DENIER CORDURA OR WOLVERINE PERFORMANCE LEATHER UPPER. GOODYEAR WELT CONSTRUCTION. REMOVABLE FULL CUSHION FOOTBED. CAMBRELLE LINING WITH 1000 GRAM THINSULATE ULTRA INSULATION. STEEL SHANK.